**SALE ITEM** Classic defenders are a rarity nowadays and its becoming more difficult for them to find the right equipment since the introduction of the 40 mm ball. All this changed when DONIC introduced their Formula DONIC technology into a long pimpled rubber. 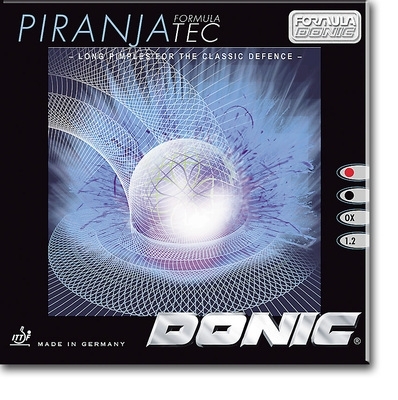 DONIC Piranja Formula Tec is soft, very elastic, with excellent gripping qualities. The DONIC Piranja Formula Tec enables the player to impart far more backspin against topspin than has been possible with other current rubber technology. Recommended for defensive backspin players who want maximum spin reversal against topspin.